It was after midnight when the bus arrived at the terminal in Bahawalpur. I had been on the road for the preceding 14 hours after starting my journey from Rawalpindi. Due to the Eid holiday rush, getting a seat on the bus was a struggle. I travelled across the scenic hilly Kallar Kahar to Khushab, but couldn’t find a hotel and so had to go to neighbouring Jauharabad. The following morning I travelled to Sargodha, then took another bus to Multan and finally managed to make it to Bahawalpur — a city that radiated positive vibes even at that late hour and after an exhausting journey. After this tiring journey, I had little patience and stamina to hunt for a place to spend the night. So I settled for the nearest place available, Kohinoor Hotel, close to Radio Pakistan Bahawalpur, with the intention of finding a better place the following morning. Indeed, I found an excellent hotel, Grand Regency, the following day with the help of a hospitable rickshaw driver, Faisal, at a reasonable price. Faisal became my city guide and transporter for two days. I was impressed by his courteous behaviour, non-greedy attitude and the pride he displayed in showing me various landmarks of his city. Taxis seem to have gone out of fashion in Pakistani cities. The capital of a princely state, Bahawalpur was initially known as Baghdad al Jadeed (the New Baghdad) because the descendants of the Abbasid rulers of Iraq, who escaped to Egypt, later came to Sindh and then settled here. Although ruled by the Abbasi family since 1774, the state was founded by Nawab Muhammad Bahawal Khan II, in 1802. Bahawalpur was an independent state at the time of partition in 1947. It joined Pakistan in October of that year and was one of the most prosperous regions of the country. It remained a province from 1952-55 before merging with Punjab. Even today it stands out as one of the most neat and clean cities of the province with remarkably friendly and laid back natives. Like Abbottabad, it is also identified with several good educational institutions, the Islamia University, Quaid-i-Azam Medical College, and one of the biggest schools in Pakistan, Sadiq Public School, being among the more prominent ones. Additionally, palaces; museums and public libraries, which are much better maintained than those in Karachi; one of the few natural safari parks, Lal Suhanra National Park; and a major zoo enrich the city. Certain species of animals — mainly lions — are bred in Bahawalpur; these are then sent to other zoos in the country. The ancient Derawar Fort is also located nearby in Cholistan Desert bordering India. The best weather to visit is from October to March. The Nawabs of Bahawalpur maintained their own army, which consisted of two battalions: 1st Bahawalpur Infantry and Bahawalpur Light Infantry, both raised in 1827. Now, Bahawalpur Corp, or 31 Corp, is a major military administrative formation of the Pakistan Army’s Southern Command headquartered near Noor Mahal at the Garrison Headquarters. Designed by an English engineer, the construction of Noor Mahal began in 1872 by Nawab Sadiq Mohammad Khan fourth. Most of its materials and furnishings were imported from Europe. Covering an area of 44,600 square feet, it has 32 rooms and sprawling well maintained greenery all around. The palace has been bought by the Army and serves as officers’ mess. Its design incorporates continental, Islamic and subcontinental architectural features. The continental character is visible in the balustrade, pediments and vaulted ceiling of Darbar Hall, while Islamic touch is evident in its domes. The angular and elliptical shapes signify the subcontinental influence. It covers an area of 44,600 sq. ft. In 1906, Nawab Muhammad Bahawal Khan the fifth added a mosque inspired by the one in Aitchison College. 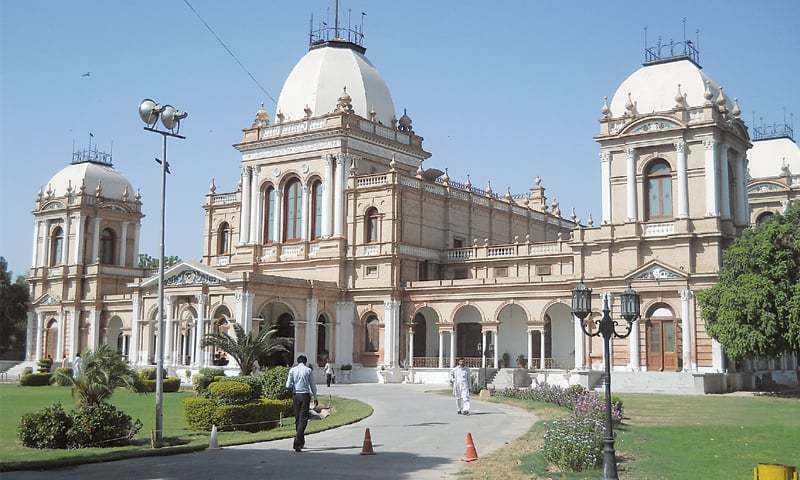 Established in 1974, the Bahawalpur Museum, though medium sized, displays the archaeological as well as the political history of Bahawalpur and Cholistan. It also has an Islamic gallery, which exhibits Quranic documents. In addition, old coins, complete set of civil and military medals and postage stamps that the former Bahawalpur State issued and used before Pakistan came into being, can be seen here. Bahawalpur adopted Pakistani postage stamps after 1949. Wood and stone carvings, camel skin paintings and inscriptions are also on display. It is a bit surprising, or at least uncommon, for a Pakistani town to be as peaceful, polite and civilised as Bahawalpur. I was told that it had a very low crime rate and a high literacy rate. Its palaces — Noor Mahal, Sadiq Ghar Palace and Darbar Mahal — and other institutions including the government hospital, are praised by its inhabitants. I also learnt that there is no single carriage road in Bahawalpur; all are dual carriage and well-maintained. A well-kept large public park in the heart of the city is a reflection of its people’s civic sense and administrators’ efficiency. The hotel, where I stayed in, cost me slightly more than the other local hotels I had been staying at including in Rawalpindi, but its standard was 10 times better. I was deeply impressed by its professional customer-friendly services, interior designing and maintenance. It was obvious that some sensible owners / managers were behind the admirable performance. Meeting its general manager, Muhammad Mirza, an impeccably dressed tall and slim man in his late 30s confirmed what I had been thinking. A native of Bahawalpur, he had worked in five star hotels as well as lived in Singapore and Malaysia. The most striking thing about him, besides being a perfectionist, was the uncommon capacity to think originally and progressively. He was working on forming an association of hoteliers and restaurateurs to strengthen the tourism industry and trade in Bahawalpur including plans to promote desert car rallies. In his opinion the potential for an international desert car rally was tremendous but the hotel capacity was not enough and they were working on expanding it. I think he and his city have a bright future ahead. I wish I could have visited the Derawar Fort, an ancient relic about a 100 kilometres from the city, but I didn’t have enough time for it. 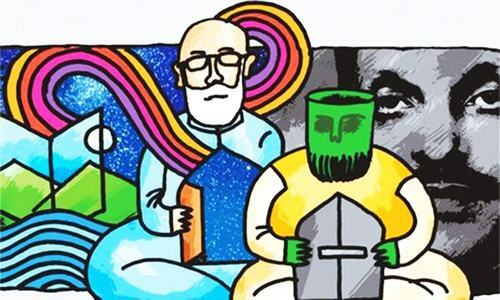 The journey back home was a 15-hour long Daewoo bus ride, starting at seven in the evening from Bahawalpur and ending at Sohrab Goth on the outskirts of Karachi the next morning. From the economic point of view, two things stood out during this road travel across the county: First is the tremendous potential for professionally-run clean small hotel accommodations — hospitality industry — in smaller towns. The second is the need for better road transportation facilities for the domestic tourist market. Although the latter has shown progress through companies like Daewoo on a national level and Faisal Movers in southern Punjab, besides smaller operators, the potential is huge for more such services if one goes by the long queues at the exclusive bus terminals. Pakistan railways have already been significantly replaced by road transport in Pakistan. All in all, this road travel on public transport within Pakistan, which I rediscovered last year, is a wonderful and absorbing experience. I am looking forward to visiting another ancient fort soon — Umarkot in Sindh!